The global collagen peptide and gelatin market is likely to be a lucrative field for dynamic and active players in the coming years, according to a new report from Transparency Market Research (TMR). Leading players operating in the collagen peptide and gelatin market include Catalent Inc., Nitta Gelatin Inc., InterHealth Nutraceuticals Inc., Capsugel Belgium NV, Rousselot, BioCell Technology LLC, Norland Products Inc., GELITA AG, and ChinaTech Peptide Co. Ltd. 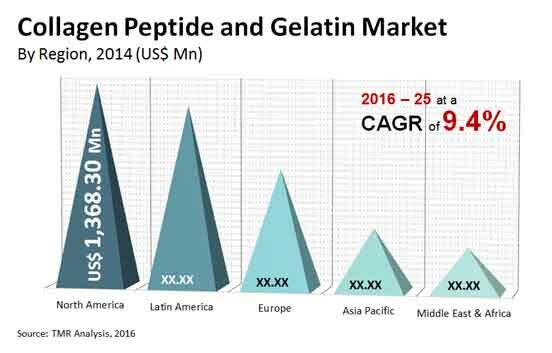 The steady rise in the opportunity is likely to be continued by the rapid urbanization in emerging regions such as Asia Pacific, the Middle East, and Latin America, which has presented the collagen peptide and gelatin market with a steadily increasing consumer demographic. Valued at US$4.5 bn in 2016, the market is likely to more than double in valuation from 2016 to 2025, with an expected valuation of US$11.1 bn by 2025. This represents a robust CAGR of 9.4% in the 2016-2015 forecast period. Due to its utility in the maintenance of skin, hair, muscles, and bones, type I collagen peptide has become a common component in cosmetic formulations. The rising demand for cosmetic products, and particularly the rising need for cosmetic products that also protect the user from environmental pollutants, is thus likely to remain a major driver for the global collagen peptide and gelatin market in the coming years. Type I collagen accounted for more than 77% of the global collagen peptide and gelatin market in 2016 and is likely to exhibit consistent growth through the 2016-2025 forecast period. Nevertheless, the rising prevalence of arthritic conditions could also help drive the demand for class II collagen peptides, which are used to aid bone and joint growth. Geographically, the global collagen peptide and gelatin market is segmented into North America, Europe, Asia Pacific, Latin America, and the Middle East and Africa. Due to consistent technological progress in the healthcare sector in developed countries in Western Europe and North America, the two collectively accounted for more than 60% of the global collagen peptide and gelatin market in 2016 and are likely to remain dominant in the near future. Asia Pacific is set to become a major regional segment for the global collagen peptide and gelatin market in the coming years. The steady urbanization and acceptance of technological upgrades has led to growing adoption of collagen peptides and gelatin in the healthcare sector in emerging economies in the region. The rising demand for cosmetics due to the growing pollution in major urban centers is likely to remain a key driver for the collagen peptide and gelatin market in the coming years. This problem is common to countries across the economic spectrum, though it is particularly prominent in developing economies such as China, India, Indonesia, and Malaysia. This has contributed to the strong growth prospects of the Asia Pacific collagen peptide and gelatin market. The rising prosperity of consumers in the region has also made it conducive for growth of the collagen peptide and gelatin market in the coming years. The expanding pharmaceutical industry in dynamic emerging economies such as India, Japan, and China is also likely to be a key contributor to the Asia Pacific collagen peptide and gelatin market in the coming years. The steady presence of leading market players in developed countries such as the U.S., the U.K., France, and Germany and the consequent establishment of strong development and distribution channels has been the key driver for the steady growth of the collagen peptide and gelatin market in North America and Europe.